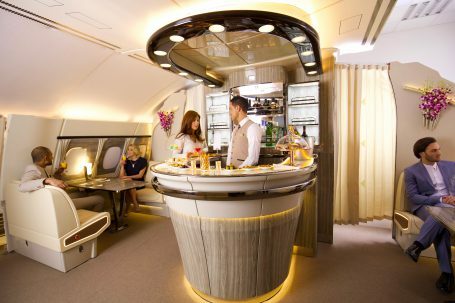 Emirates’ newly revamped A380 Onboard Lounge has made its operational debut on a flight to Kuala Lumpur, marking the 9th anniversary of the airline’s award-winning A380 service. The Onboard Lounge was first introduced on 1 August, 2008 and has since become a mainstay of Emirates’ double decker aircraft. Now in its 9th year, the Emirates A380 Onboard Lounge is arguably the most popular social spot at 40,000 feet. The latest makeover of the lounge, inspired by private yacht cabins, features a more intimate and social area. With a clientele made up of Business and First Class customers on board the A380, the exclusive lounge accommodates 26 guests and serves the finest wines from around the world. The six wines on offer differ by destination but a champagne offering of Moët & Chandon or Veuve Clicquot is always available. Emirates has over 6,000 crew trained as mixologists who can whip up 14 cocktails such as its signature Bloody Mary or a non-alcoholic Apple Spritzer. The lounge stocks fine spirits such as Hennessy XO Cognac and Chivas Regal 18 year old Scotch whisky. It also serves over 18 different bar snacks, the most popular of which are the smoked salmon bagels and fresh fruit skewers. For those who prefer a perk me up, the menu also includes juices, Illy coffee and several varieties of tea from Dilmah. At the back of the lounge, a 55 inch LCD screen gives customers the latest flight information, or live TV broadcasts of the latest news or sports updates. Emirates has also recently expanded its Wi-Fi offering to give patrons of the lounge who are Emirates Skywards members free Wi-Fi throughout their flight. Emirates flies the A380 to 48 cities on 6 continents. The latest cities to join the A380 network this year are Sao Paulo, Casablanca and Nice. Emirates is the world’s largest operator of the A380 aircraft with 96 of these double-decked aircraft in service, and a further 46 on order. The Emirates A380 is a popular choice for travellers, carrying 80 million passengers since 2008.